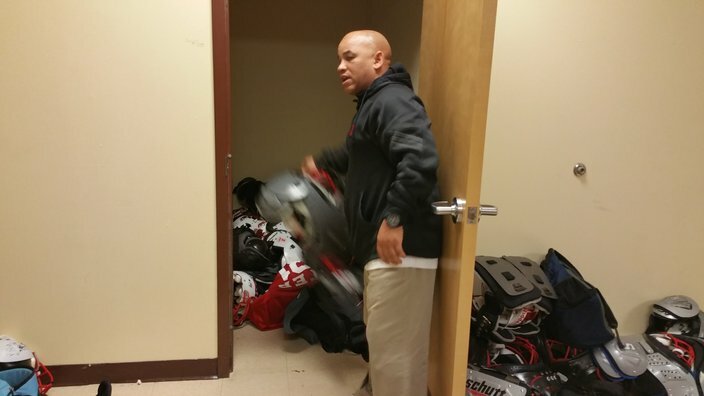 Imhotep Institute Charter High School head football coach Albie Crosby. The morning haze hasn’t lifted yet and you’ll see him there, head propped up against the window of his car, a solitary shadow out front of the indistinct brown and gray building that fills a city block at the intersection of North Philly’s 21st and Godfrey Avenue. There’s no football field or practice facility around the place. You wouldn’t even know it’s Imhotep Institute Charter High School unless a passing neighbor tells you. There are no signs that say Imhotep in front of the school, which is encased by a cyclone fence and coiled barbed wire on top. Albie Crosby likes to arrive at the school with no name before anyone else. Inside Imhotep, just up the front stairs and to the right sits Crosby’s office. His four walls were barren when he arrived. Now they’re adorned by posters from some of the biggest college football programs in the country, interspersed with banners rewarding the Panthers’ recent success. In four years, the diminutive Imhotep football coach with the constantly hoarse voice like he’s been up for 20 hours has made the tiny school that fits 600 into a state football powerhouse where a who's who of the nation’s most prominent college coaches come to visit. Crosby, 46, a 1988 West Catholic grad and former Burrs’ assistant coach, is part psychologist, part mentor, part big brother, part surrogate father and full-time football coach, who juggles everything from homeless players, to where the team will practice on a daily basis. A few blocks away, the Panthers drill on an uneven dirt baseball field strewn with glass, rocks, dog excrement and few other assorted things on the Lonnie Young Field they share with the Northwest Raiders Pop Warner team. Their weight room is as large as a master bedroom; their locker room is a closet. They change in the school hallways and at the field. Imhotep hasn’t kicked an extra point this year because it can’t. There are no goal posts at Lonnie Young, so the team always goes for two after a touchdown. And somehow, Crosby manages it all. Under his guidance, the Panthers are 53-6 in his four years, winning four Philadelphia Public League titles, three PIAA District 12 championships (two at Class AA, one at Class AAA, unseating two-time defending Class AAA state champion Archbishop Wood this year), and reaching the Class AA state finals (in 2013 as a Class AA, when the Panthers lost to South Fayette). Friday night topped it all when Imhotep Charter throttled Cathedral Prep 40-3 in the PIAA Class AAA state championship game. It concluded an improbable journey for Crosby and the Panthers, who finished 15-0 and were the nation’s No. 13 ranked team according to USA Today, right into the history books as the first Philadelphia Public League team to win a state football title. “When I first came here, I didn’t know anything about Imhotep,” admits Crosby, a Virginia Union grad with a degree in criminal justice who once aspired to be in the secret service. “I had a perception of Imhotep, and I found the perception wasn’t the reality. I thought when I walked in here I was going to be walking into madness. But when I actually walked through the doors, it felt like West Catholic. A lot of these kids are the same type of kids. Some come from two-parent households, most of them from single-parent incomes and some of these kids have nothing. One of them was Taleem Muhammad. “I applaud him and his family,” Crosby said. “I thought I saw everything, but when I was told we had kids who were homeless on the team, I didn’t understand what being homeless meant. We still have homeless kids on the team. We have a couple of different kids who live in shelters. We have some kids living house to house with family members, and other kids who just squat with families. We have players who flat out live in squatted areas; it’s a testament to our coaches how they support our young people. “I think there are three types of football coaches. There’s the coach that knows a lot of Xs and Os and can coach up everything. Then they get in their car and go home. They know their players by numbers, No. 17, No. 26, No. 34. And then you have those coaches who know nothing about football, but they know their kids. If any one of their kids is ever in trouble, the kid knows he can call his coach. Then you have the third coach, who kind knows both, football and his kids. I’ve been fortunate to have the people around me at Imhotep that are that third type of coach. Our whole school culture supports that philosophy. I’ve been fortunate to be associated with coaches like Gabe Infante (at St. Joe’s Prep) and (West Catholic’s) Brian Fluck; guys who I would say are that third type of coach. It’s not about me; it’s never about me. If you care and know about your kids, you know everyone has issues. "What our vision was for him and what we got is even more than what we thought we were getting in Albie. His influence as a mentor is even greater than his influence as a coach." It’s part of what Crosby does. Muhammad, who currently attends Philadelphia Community College and is looking to transfer to St. Joe’s, credits Crosby’s visceral intuition for aiding him. He wasn’t about to let Crosby, nor anyone, aware of his situation. But there were signs. Imhotep students are mandated to arrive at school at 9:45 a.m. and are dismissed at 5 p.m. The football team, however, has to arrive at 8:15 a.m., a Crosby dictum, when morning workouts and film sessions are held. A lethargic, disinterested Muhammad always looked like he was somewhere else. It didn’t go unnoticed to Crosby. A few years ago, Jahmir Johnson, the Panthers’ 6-foot-5, 272-pound senior right guard, admits he was lost. He played basketball to fill time, with little motivation towards anything else. Now he has seven scholarship offers, among them Temple and Illinois, and carries a 3.54 GPA. He lives with his aunt and found a purpose. He also found someone beyond his immediate family who cared about him. Crosby didn’t want to leave West Catholic, where he was the offensive coordinator and where he won a PIAA Class AA state title in 2010 when the Burrs destroyed South Fayette, 50-14. But when the Archdiocese of Philadelphia in January 2012 announced that West Catholic was closing its doors, Crosby was torn. 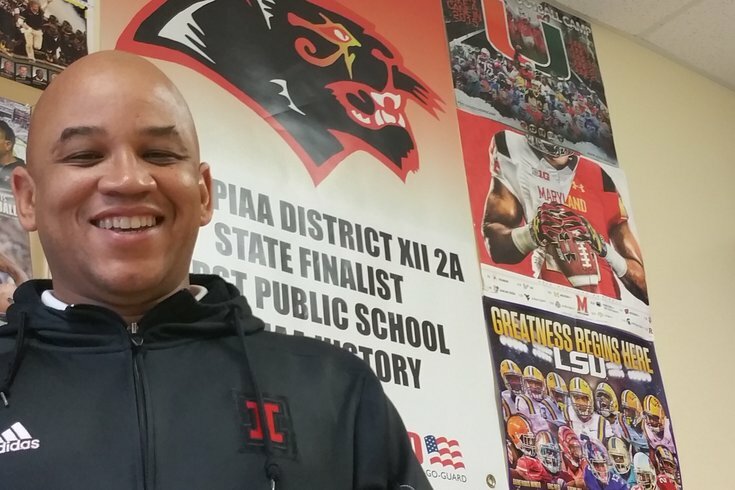 Andre Noble, Imhotep’s athletic director and highly successful basketball coach, jumped at the chance to woo him. It didn’t come without a fight. It’s what further sold Noble. Four years ago, Crosby walked into a barren office with nothing but a blank grease board in it. He says that clean slate opened the opportunity for him to establish his way. It’s what led to developing players like DJ Moore (now at Maryland, where he was an all-Big Ten rookie wide receiver) and David Williams (South Carolina). And current players like Naseir Upshur (Florida State), Tyliek Raynor (Arizona) and massive 6-4, 336-pound Johncarlo Valentin, one of the country’s best offensive lineman. Perhaps his biggest lesson came the last time Imhotep was in the state finals in 2013, when the Panthers took a 41-0 pasting from South Fayette, beginning the game by going offside five times. “Some media guy called me right after and said he was sorry for our loss,” Crosby recalled. “My response was, ‘What loss?’ He said the loss of the game, ‘Your guys got blown out.’ I said we did, but we didn’t lose. He said, ‘what do you mean you didn’t lose, I watched it.’ I told him I took 50 kids up to Hershey and they stayed at the Sheraton Hotel. Some of those kids never stayed in a nice hotel before. We went to Chocolate World. Some of those kids never went to Hershey Park before. We had dinner the night where those kids were able to order anything that they wanted. Some of the kids knew what it was like to be hungry. They have memories, I told him. We didn’t lose, we’re winning. The game came up short, but we’re winning.